I managed to live with the RA and work up to retirement when I suddenly had 50 hours a week to do whatever I wanted. Learning a new language and catching up with my book collection had less appeal than I expected so I adapted the idea and decided to learn to speak "medical". When the chance to change gears finally came, patient engagement and working for change in health care looked more interesting and rewarding. Another early collaboration was a SPOR funded demonstration project, where our team developed tools for partnering in health research for both patients and researchers based on our experiences as members of health research teams. The tools help each group learn to work with the other. We also included a set of additional tools for evaluation. Why would researchers want to or feel compelled to engage with patients? Are there benefits on both sides? How do interested patients and researchers find one another? and then think about why the status quo has changed from what was normal practice in the past ie no patients. One of the reasons for change would be the policies of the organizations that fund research. Here are quotes from three of them. The SPOR (Strategy for Patient Oriented Research) program at CIHR - " Patients need to be involved in all aspects of research to ensure questions and results are relevant"
encourages its stakeholders to engage in Knowledge Translation and Patient Engagement which occurs when patients play an active role in defining issues, considering solutions, and identifying resources or priorities for action which can take place at a variety of stages in the research, planning or implementation phases of a project. Budget – include costs of recruitment, participation and support. The ideal is to have patients involved through the whole process, from choosing the question to the Terms of Reference, and the protocols, as well as data gathering and analysis. Of course patients and caregivers are not researchers. In many cases it is our lived experience that gives us expertise and insights that can be useful. 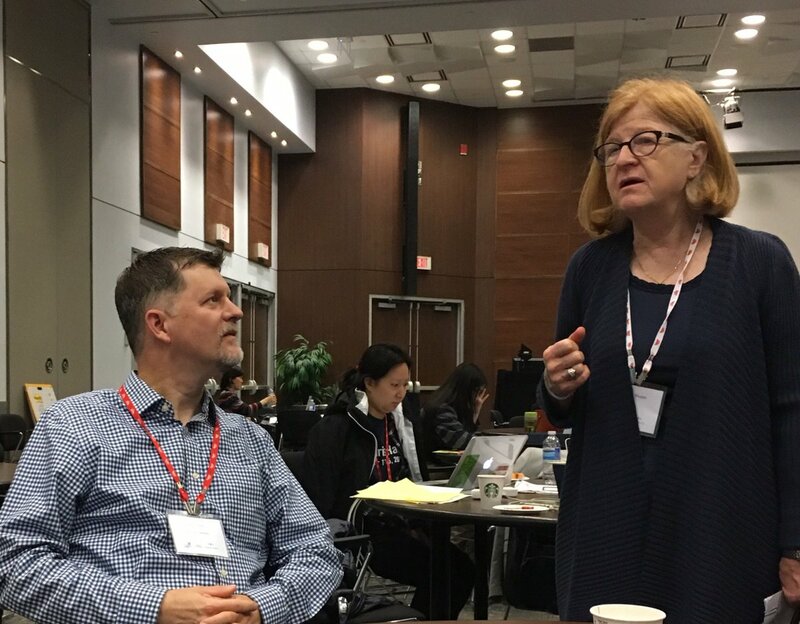 There are some courses offered to help patients develop a better understanding of research and for researchers to learn about partnering and team building. Here are some that I know of. 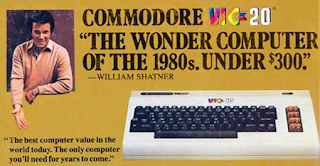 Some of us have taken the TCPS-2 Ethics course or other courses like those above. Of course if we need to do a CIHR CCV that may take support. That is a specialized CV meant mainly for researchers which is sometimes required for patients. 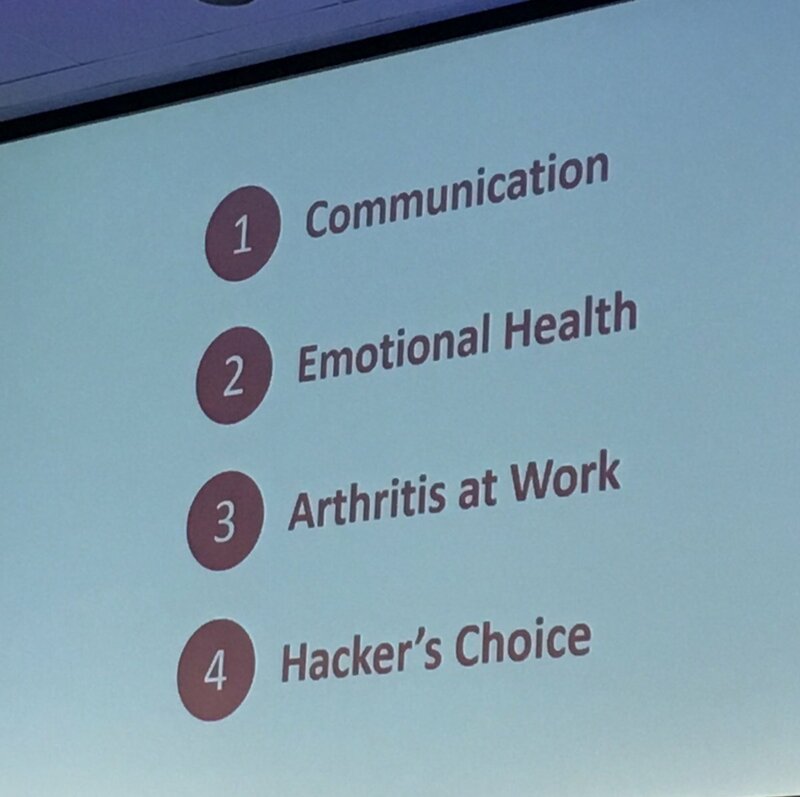 I found there were many areas that did not apply to me as a patient. Patients and family members should be full partners and collaborators because they are key stakeholders through paying for the health system, and have a personal and societal interest in improving outcomes. They may also have life experiences or background that can be useful. 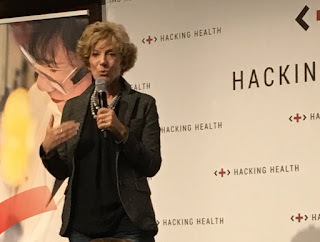 One night at dinner with other patient researchers we had a speech language pathologist, a molecular biologist, an IBM Watson team member, and a recruiting expert around the table. Of course partnering is the essence of engagement. 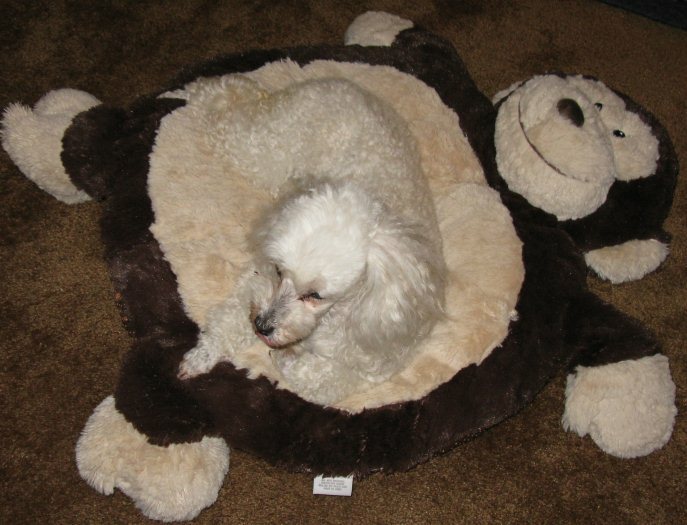 I have sometimes seen that the distinction between patients and subjects can be unclear. Generally I would say that if you wanted me to sign a consent form before I participated I would not consider myself to be a partner, I'd be a subject. The strong support for patient inclusion at the funder level and access to information has made a big difference to the numbers of interested patients and caregivers over the past five years. There are many enthusiastic patients.who are willing to be involved. As an example, for the Health Minister's Patient and Family Advisory Committee (PFAC) in Ontario there were 1200 applications. The CHI Partners conference received 170 applications for about 12 spaces. The Partners in Research course fills up very fast and has wait lists. 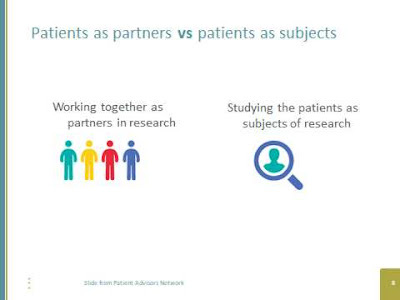 So, how do researchers find patients and caregivers who want to be research partners? One idea is through a community of practice for patients called The Patient Advisors Network which is a national Canadian group. Members can share opportunities to get involved on the groupsite, after they join. 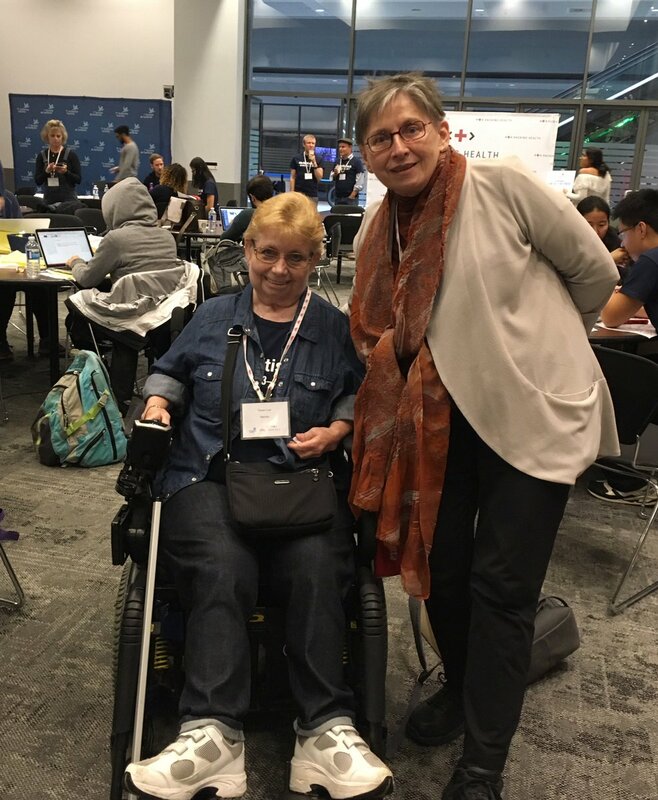 There is also a provincial Support Unit of SPOR in every province which may give you tips for involvement, and in BC there is a group of 700 patients and caregivers called Patient Voices Network. You might also find potential collaborators on Twitter, where the clinician, researcher and patient community is quite robust. And even in lab science where the research might be concentrating on platelets, mouse knees, or HLA antigens there is a place for patients. Having patients involved is an effective way to ensure clear language is used in writing and promoting real evidence-based messages to a non-scientific audience, or to increase the impact of the research results to the people who will ultimately benefit. 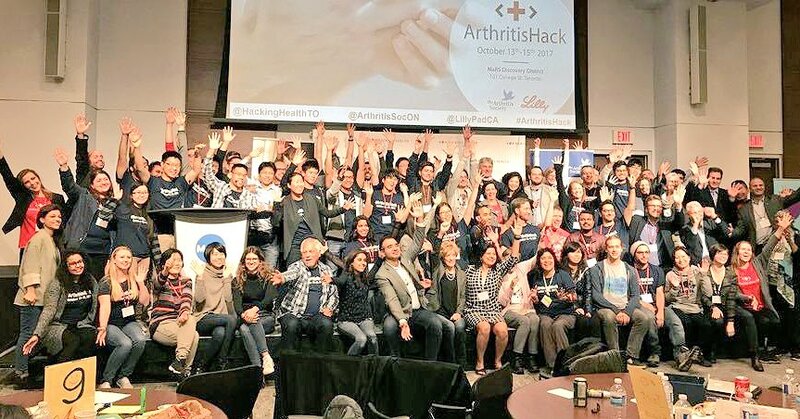 Researchers at ARC (Arthritis Research Canada) collaborated with a patient group, CAPA (the Canadian Arthritis Patient Alliance) to produce the recent #ArthritisParent tweetchat, that showcased recent research on biosimilars and pregnancy. 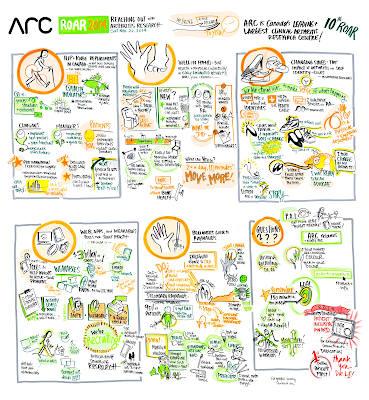 ARC is also the group that produces ROAR which is a collaboration of patients and researchers presenting arthritis research. 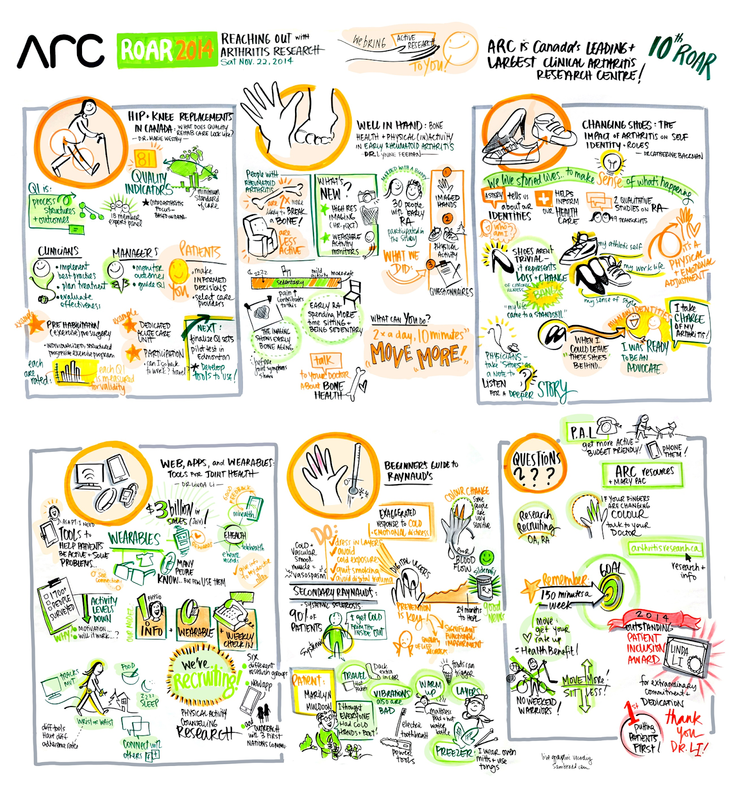 #eROAR is an annual event done live and by webinar and tweetchat to showcase research done by ARC. You can find the 2018 videos here. Here's one of my favourite efforts to make science understandable for everyone. This international contest has challenged scientists at every level – from graduate students to senior researchers – to communicate familiar yet complex concepts in ways that are understandable to an 11-year-old. Alan Alda founded the Flame Challenge organization and the prizewinners are fascinating. ** Are you interested in taking the program? Last year's in-person National Conference took place last April, and here's a retrospective look at it. This year the Conference is on April 27, 2019 in Mississauga, Ontario and you can register here. We had a very full day with informative speakers in every time slot. The day started with an introduction from Dr Lisa Prokopich, the SJSC Vice-President. Our first speaker, Dr Julian Ambrus is Professor of Medicine, SUNY at Buffalo School of Medicine, Division of Allergy, Immunology, and Rheumatology. He gave us an overview of Sjogren's and information on "New Ideas" He pointed out that Sjogren's is a systemic disease defined by dry eyes, dry mouth, decreased tear production and salivary flow, and it can also involve lungs, kidneys, neuropathy, vasculitis and that 5% of those affected may develop non-Hodgkin lymphomas. He told us that the submandibular gland was the first to be affected in Sjogren's, then the parotid gland, finally the sublingual gland which is under your tongue. After an overview of current treatments he said early diagnosis is critical, even though current therapies are inadequate. He suggests that patients with Sjogren's be followed carefully by doctors who know what they are doing. We need new therapies to restore function to tear and salivary glands, and to prevent complications and systemic problems. Dr Ambrus and colleagues are involved in research about IL-14, a B Cell growth factor which is increased in patients with Primary and Secondary Sjogren's. We hope this will yield good results in the future. Our next speaker was Dr Richard Maharaj who is the Clinic Director at eyeLABS Centre for Ocular Surface Disease who told us that living with dry eye disease does not have to be a life sentence and that treatment options have exponentially increased, though there are challenges in diagnosing Sjogren's Syndrome. Eye care providers are critical in the process of diagnosis. He mentioned some in-office treatments such as LipiflowThermal pulsation for Meibomian Glands, IPL (Intense Pulsed Light) treatments for MGD, and eyelid and tear inflammation, Blephex, and amniotic membrane grafts. One shocking fact is that 50% of adults with Sjogren's are undiagnosed. We know from past conferences that the time to diagnosis is too long - Dr Maharaj said that patients have symptoms for an average of 3.9 years before they are diagnosed. He also gave us three rules for dry eyes. 3. Triglycerides - Omega 3's. We need this to be bioavailable. We heard from Dr. Heather Palmer next. She devotes her time to applying what is being learned through science to help all people to maximize their cognitive capacity. Her topic was the much dreaded and often mentioned among patients "Brain Fog". She told us that the three main issues that affect your brain function are pain, fatigue and worry. It was also reassuring to hear that brain fog exists, it is not in our minds, and that symptoms may vary from person to person. This year for the first time ever we had a Patient Panel. The four members represented different aspects of the involved patient experience. Joyce Hambly, our support group leader in the Kitchener-Waterloo area spoke about the benefits of being able to talk person to person about issues and symptoms with other people who understand. One rule of support groups is "What is shared in the room stays in the room." For new problems the group brainstorms. 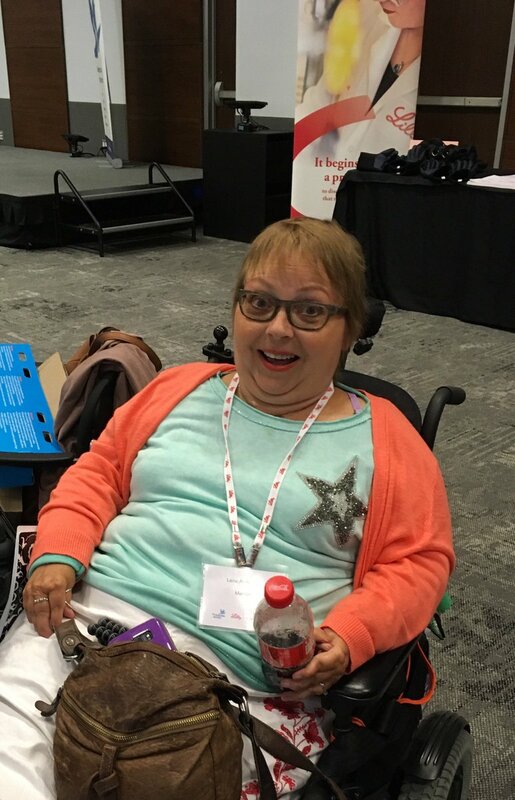 Sjogren's Board member Janet Gunderson gave us her insights about being engaged and involved as a patient advisor while living in a remote rural area. Hearing her advice and knowing that she lives in northern Saskatchewan and has a really positive impact through her volunteer work was very inspiring. Even though she is somewhat isolated, she makes a valuable contribution as an engaged patient. 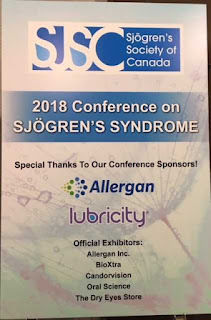 Annette McKinnon talked about what she learned as a patient who has been involved with the Sjogren's Society of Canada from the beginning. She stressed the value of patient organizations, especially for diseases that are not well known. Patient groups help with awareness and education, and help people realize they are not alone with their problems. Then Sharon Marafon talked about that vital issue for patient groups - funding and fundraising. It's a real struggle for a small grassroots patient organization to just exist, especially when Sjogren's takes such a toll on our members. She has been an amazingly effective fundraiser and event planner for many groups in the past, and she was one of the masterminds of Sjogren's 'Old Bags Fundraiser' a few years ago. We were also delighted that an anonymous attendee made a generous donation and volunteered to match donations that others made at the conference. We would like to thank our anonymous benefactor. When Dr Arthur Bookman got up to speak he was welcomed as the Chairperson of the Sjogren's Society of Canada Medical Advisory Board. He is also a distinguished rheumatologist and the Coordinator of the Mutidisciplinary Sjogren's Clinic at the University Health Network in Toronto. 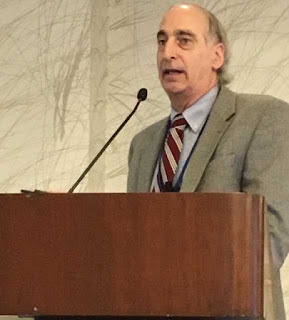 His talk this year was titled "Sjogren's Disease: Redefining and Repositioning"
He began by reviewing the classification criteria for Sjogren's and stressing that these criteria need to be sensitive and specific for an accurate diagnosis. It's interesting to see how the results he sees in the clinic compare to those found in literature. He went on to review the benefits and shortfalls of Rituxumab, which is seen to benefit salivary flow, dry eyes and mouth, fatigue and extra-glandular manifestations. Unfortunately the research results are not a slam-dunk: Maybe the wrong patients are chosen, the wrong targets are selected, or the outcome measures are not appropriate. Dr Leslie Laing, the new President of the Sjogren's Society of Canada, spoke to us about "Controversies in Sjogren's: From Implants to Fluoride" She began by reviewing the benefits of healthy saliva flow. I had not realized the part it plays in ensuring dentures are comfortable. Another question she addressed was about the extent to which a history of Sjogrens Disease affects the failure of dental implants. Though there may be some drawbacks in most cases the implants survived and were an aesthetic and functional solution. The day closed with Dr Miriam Grushka, with a talk titled "Why is my tongue sore and why does it hurt and what happened to my taste?" Looking at the dry mouth in Sjogren's the tissues look dry, red, irritated and may have ulcerations. This can lead to opportunistic infections, such as yeast infections which actually changes the architecture of the tongue and can lead to sore, burning tongue, loss of taste, burning mouth, and difficulty eating. In some cases the loss of taste is a sign of loss of tastebuds. We'd like to thank our round table session hosts. You can learn a lot from experts while they are being peppered with questions from your peers. I learned that eyes are a significant frustration to most of us and that memory and cognition courses only benefit those who actively make changes. As usual we had a draw for donated prizes. Thanks especially to Wendy Shingler for her hand-crafted jewelry donation. 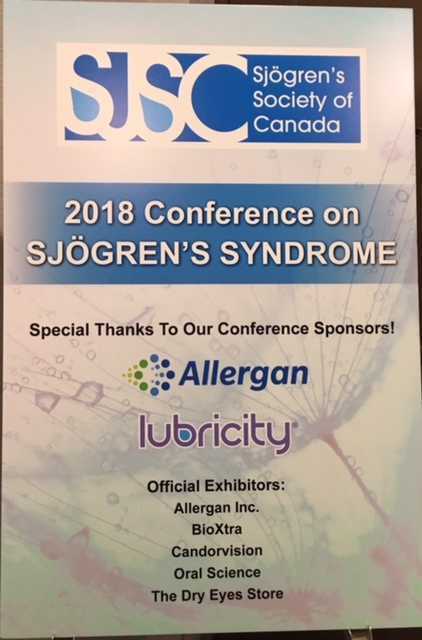 Of course this could not have been done without our sponsors Allergan and lubricity, and our exhibitors, Allergan, BioXtra, Candorvision, Oral Science and The Dry Eye Store. 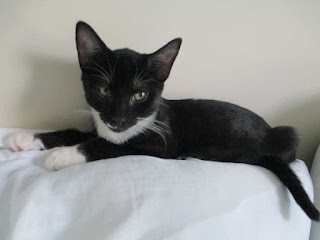 This post is partly crowd-sourced from my online support group that's been together through thick and thin, even losing a few members from complications as we have talked over the years. Speaking for myself, writing this blog and choosing the pictures my old friends shared in the past made me feel decidedly better today. Tricks seem to imply that you are fooling yourself or your body, and I just don't see that as a working strategy. With the brain in charge - it's a losing battle. So, the tips are better then the tricks. I think eating ice cream would be appropriate. We look like we are feeding monkeys when we go to the store because we buy so much fresh fruit and vegetables. We have at last one serving of a fruit or vegetable and usually more with every meal. Aging –you’re not old - I have read that 65 to 75 is "Young" old, 75 to 85 is "Old" and 85 plus years is "Very" old. The above comments are from Dolly's mom. We're not rewarding to our doctors. When we start to have rheumatoid disease longer and things start to pile up....there isn't much that can be done. One of the reasons I haven't gone to another rheumy is that 30 plus years with r/a is a long time. It’s all progressive. I feel invisible a lot of the time. I think you don’t get much attention if you're solo. Some of us are getting a little tired. How many rounds is this fight? I am so tired of fighting for things now. I really feel like just giving in. Not every patient is interested in their health care. I think more should be available to educate people on the necessity of taking responsibility for their own health. "No one cares more about your health than you do" is what I would tell them. So on one hand you have the world where the doctor is seen as "God" and all knowing, and on the other, many people who have a variety of expectations of their doctor, including wanting to be part of the treatment process. Then there is the minority who want to be really involved including having a voice in decisions that affect the health care system, and the policies that govern it. Even though some see them as "Not the unheard voices" they are still essential to pave the way for more patients and caregivers to take on a larger role. So I'd like to thank all the people who go above and beyond their expected roles, for doing the sometimes exhilarating and often thankless job of being patient and caregiver advisors. This blog is part of RD Blog Week. See more here. It has been an illuminating time recently on social media, hearing patients and caregivers express feelings of frustration, and of being used and vulnerable. It's likely they too have been described as "Expert Patients" or "Professional Patients" to their faces, and in referring to people like them. I find the implications of both expressions offensive in their suggestion that I am taking a space where an 'unheard voice' should be sitting. I did not choose to become a patient; none of us do. I developed a chronic disease 30 years ago that continues to this day and has seriously damaged my bones and joints. I get involved with issues and causes and try to contribute positively to finding solutions or answers that will effect change because I know many system weaknesses and pressure points first hand. Now that I have developed more knowledge about the health care system I can deal with it better on my own behalf and can also be involved in efforts to improve the situation for other patients and caregivers. But as Dawn Richards said in her BMJ patient blog this year, the patient is also a person. In my deepest self I am not a patient, but in any interaction with the health system, that's my assigned persona. Being the 'Expert Patient' that I am considered to be does not mean that I have stopped having my own inconvenient personal encounters with health care. a) Being knowledgeable does not mean I don't need medical help. b) Expending my energy as a volunteer does not mean I am healthy. c) Spending hours every week reading and learning enough to be able to follow and contribute to high-level conversations about system issues should not be something used against me. d) It is not the job of patient volunteers to make the volunteer pool diverse and inclusive. e) Not everyone who would like to volunteer is able to. It's ironic that those who are least able are often the only volunteers around the table, giving their own time to benefit others. Another issue is patient engagement as highlighted recently by Isabel Jordan @seastarbattitta. Her story of being profoundly disregarded after working on a project as a team member, and then being ignored can be taken as a lesson in how NOT TO engage patients. When I began to be involved as a patient partner, or as a conference invitee I was excited and happy just to be there. After years of experience my sense of tokenistic involvement is a lot sharper. One of my older posts is about the Authentic Patient Voice and how much I wonder what the main agenda items at meetings would be if patients choose them without being 'guided' by well-meaning professionals. It is disturbing to see patients characterized as being responsible for overcrowded emergency departments, as seekers of pain treatment, as pushing doctors into prescribing unneeded antibiotics and tests, and as non-compliant with medications. It only makes sense to involve all members of the team in creating solutions for health system problems, and that team includes patients, who are actually paying for the whole health edifice as taxpayers and as users of non-covered services. When volunteering as a patient advisor I don't like being called an 'expert patient' or 'professional patient'. 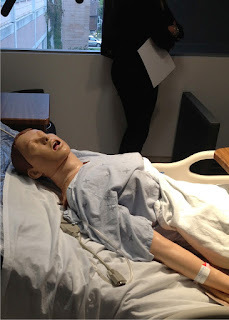 Gaining experience with the health care system was never my goal. The work involved in being a patient is a real burden. If #patientengagement specialists look at me and wish I were an unheard voice, rather than an older white woman who is retired, why don't they work harder at inclusion? They could reach out to communities that include the people they would like to see, and invite them to participate, or at least ask them about methods of participation that would make them comfortable with the process. If researchers or organizations feel their initiatives will have failed if they simply give greater voice to those who already have loud voices, what are they going to do about it? Blaming the people who are helping you now will not attract people with different viewpoints or backgrounds. As a person who spent 20 years recruiting I know it takes time, energy, and innovative strategies to include people you seldom see represented around the table. 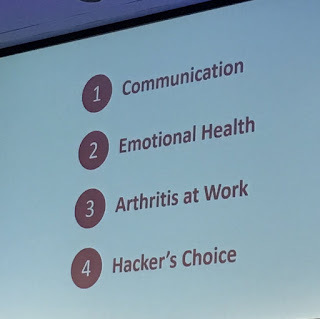 I had never been to a hackathon before, and to be a judge on my first experience was worrying, but one thing I know a lot about is living with arthritis, apps for chronic illness, and patient engagement. That helped me to take the step into the unknown. 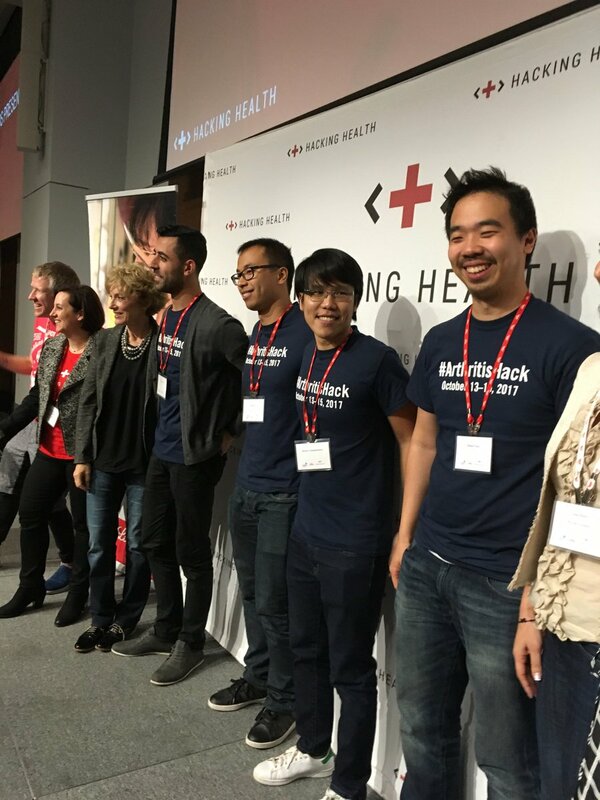 You might wonder what actually happens at a hackathon and how a patient or caregiver can get involved. I found out it's all about design, like a race to produce a great solution for a problem in the space of a weekend or less. 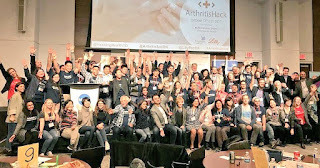 Those involved in doing this include software developers, graphic designers, interface designers, project managers, and in this case rheumatologists and patients who have arthritis as experts on the subject of arthritis. A Hackathon incorporates a user-centered-design process, so the creators start by talking to the intended users of the applications they plan to build. The first night got off to a great start with introductory speeches from the sponsors and #HackingHealthTO. 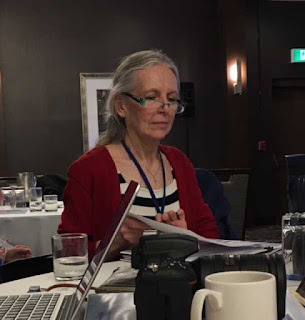 Patient group leader Dawn Richards was there from CAPA (Canadian Arthritis Patient Alliance) and spoke about arthritis and the issues involved to put the disease into perspective for the teams and sponsors. Some of those attending as mentors were good friends who I have met through other engagement activities. There were 11 teams there using their skills and creativity to produce the next amazing app. Both patients and doctors gave advice about what was practical, desirable, useful - what would make the app something that could help people. 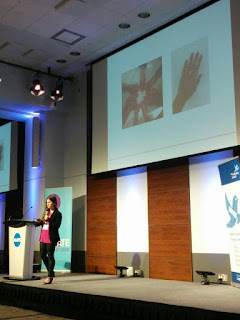 The Arthritis Society held this event with sponsors Eli Lilly Canada and Cossette. 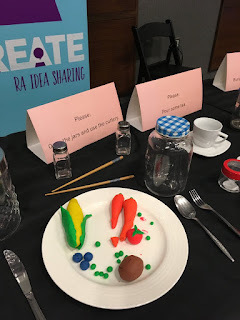 The Lilly team produced the food and display below to illustrate some of the problems involved with rheumatoid arthritis. The prizes for winners of the competition include coaching and marketing help to the winning solutions into shape to compete for people's attention. It was great to see so many people pitching in to help people living with arthritis. The winner was an app that is all about community. You'll have to wait for the future to see it in action. Keep watching The Arthritis Society website. 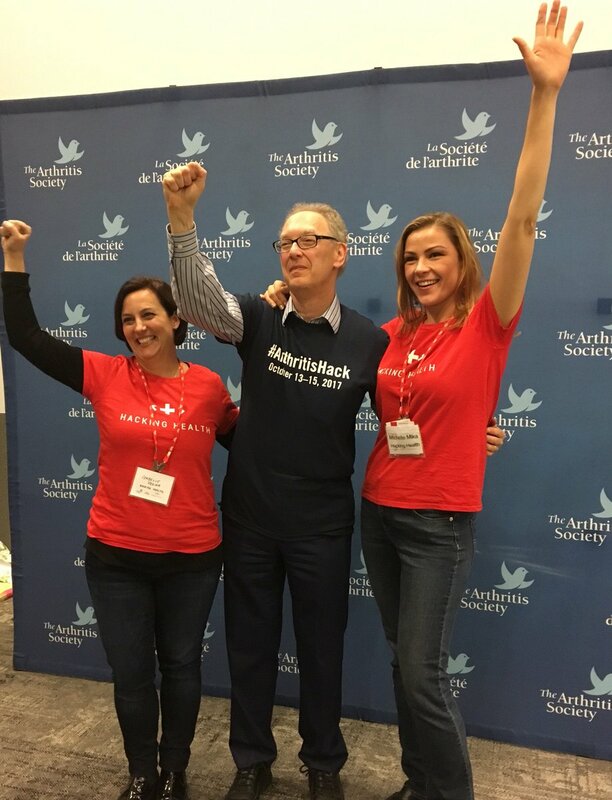 And Janet Yale, the CEO of The Arthritis Society, gave us a final goodbye with thanks for all of the great ideas and great results. I've had rheumatoid arthritis for 30 years. I spent the last 20 working full time in market research. Now health advocacy and the quality of life with chronic illness are major interests. It's great to have time to blog and tweet and go out for lunch. Where's my Prescription Summary, Shoppers Drug Mart? Copyright held by Annette McKinnon. Picture Window theme. Powered by Blogger.